Yes! We're OPEN for the public! 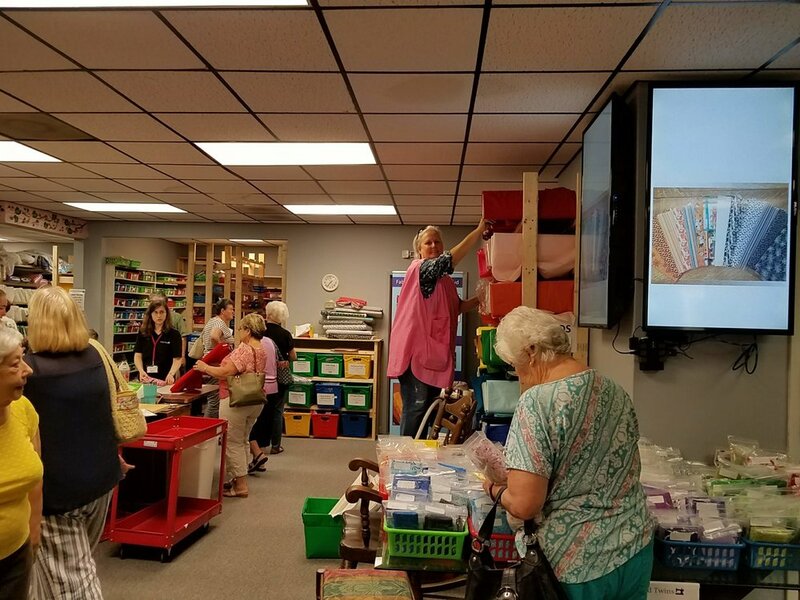 Every Thursday afternoon, since February, we've been open to the public to come in, browse and take home some of our fabulous goodies at bargain basement pricing! Each week we have lots of laughs, lots of show 'n tell and lots of fun! If you're in town, be sure to stop in. It's a blast! Here are some pictures! Don't worry, I'll get these pictures up on the show 'n tell page, if it's a quilt top that was made using our fabrics! On Thursday, June 21, 2018, we decided to try to reward those summer residents who stick out the Florida heat! So, for each visitor who showed up, we gave each person, age 12 and older, a fat quarter! We had a splendid turn out! What fun it was to watch wives go get their husbands out of the vehicle, so that they could claim a free 1/2 yard of fabric, otherwise, they'd just get a lone fat quarter! Bring a friend, and you get one for you and you could get your hubby's too! Crowds gathered early on this past Thursday. As soon as the doors opened, people started to come in. 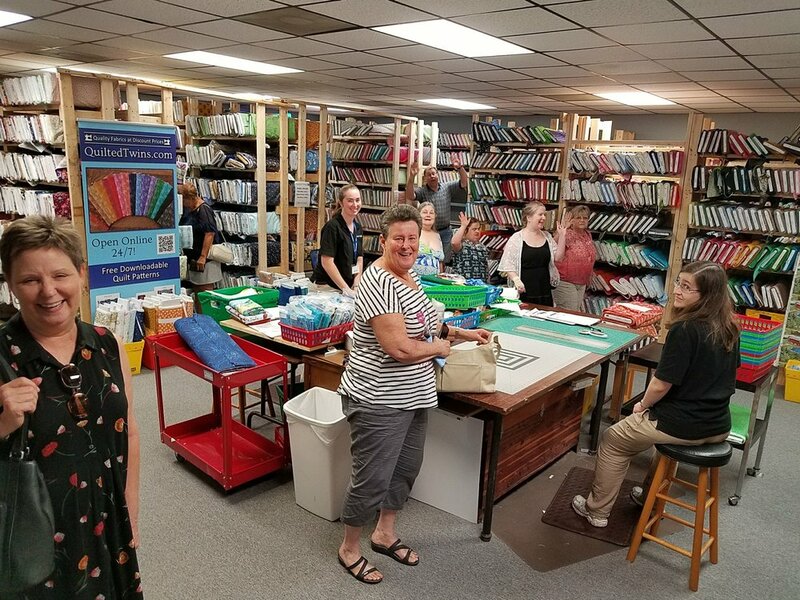 Then, we had our share of those amazing ladies who bring in their finished quilt tops! Wowsers. This week we had some beauties, plus lots and lots of promises of more beauties! Helen and Treva really outdid themselves! 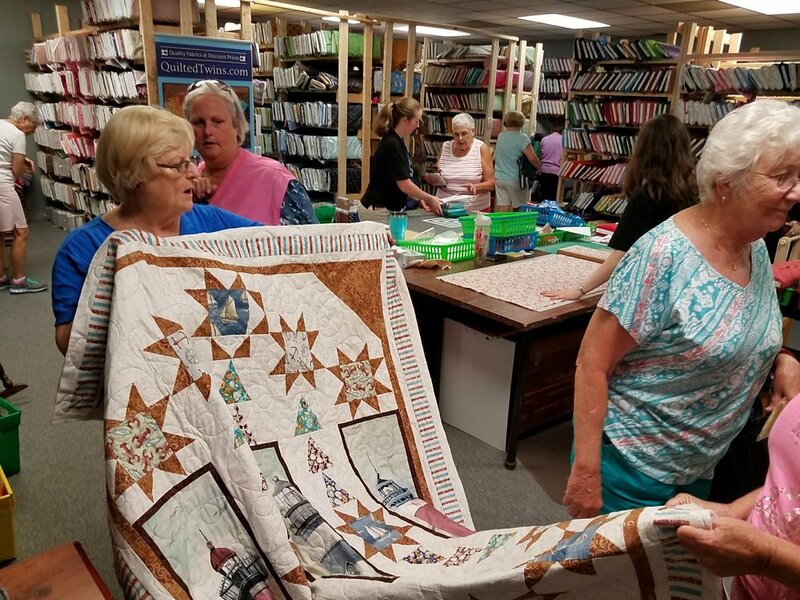 In the top one below, Helen is showing off her beautiful quilt plus some of our long-time friend, Susan Stephens Schmitz of Quilted Chick here in between Dade City and Zephyrhills, Florida. She does beautiful work and it's all hand (custom) embroidered. 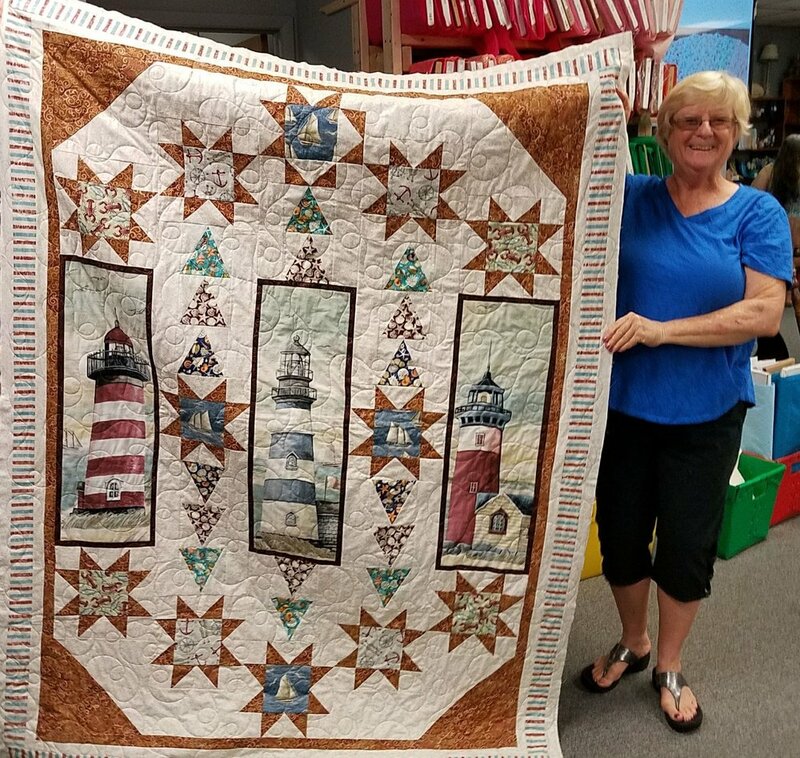 In the above quilt, Treva used our brown and camel packs to create this stunning quilt top, which has hand embroidered barns. Yes, you read that right. She hand embroidered those barns! We were all gobsmacked. She used those browns and neutrals beautifully. All in all, it's such a grand time. Ladies who do not know each other hang out and meet each other. 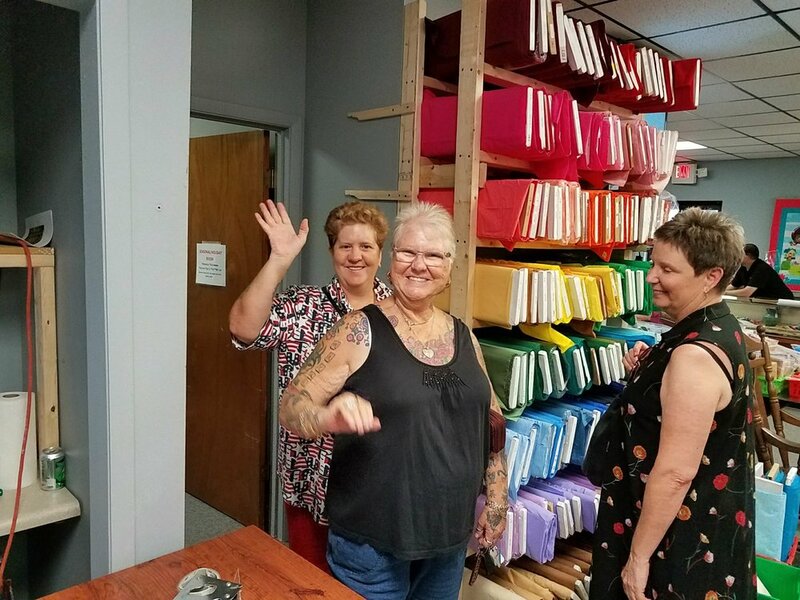 People who do know each other pick, tease and pick out fabrics together! In the meantime, we try to help and to share our knowledge, to find everything from peacocks to pirates to doll fabric for people. It's a blast. Then, there's Herman. Mud (above in the pink smock) met him in the fabric department of Holly Lobby. He drives over from Land O Lakes. He walked out today with over 30 of Becky's patterns! All in all, we've grown to love Thursdays. We love to share in what YOU all do. Cultural: Where exactly is Poland?